Sacramento region residents with vision loss will have greater access to low-vision and blindness technology and products thanks to a new partnership between Sacramento nonprofit Society for the Blind and North State Assistive Technology in Chico that began Feb. 1. 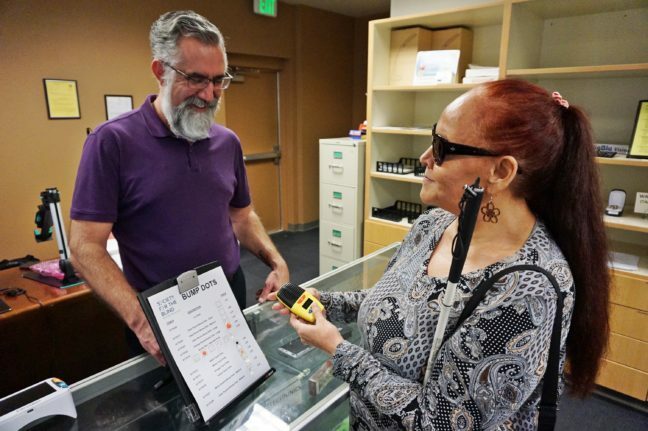 Through the partnership, Society for the Blind’s onsite retail store at 1238 S Street in Sacramento is now open 10 a.m.-4 p.m. Monday through Friday and will include weekend and evening appointments. The store, now called North State Assistive Technology at Society for the Blind, offers an expanded collection of assistive technology products with better pricing, in-home delivery and set-up, training and online shopping. For more information, visit SocietyForTheBlind.org/Store. “This partnership ensures a one-of-a-kind retail store for our region that continues to offer products and devices for people with vision loss while also expanding to provide even better service to the many Sacramento region residents who are learning how to achieve fulfilling lives with vision loss,” said Shari Roeseler, executive director, Society for the Blind. The expanded store features products and devices for people with low vision and those with no functional vision, including canes, talking clocks and calculators, kitchen products, and various video imaging and optical reader devices. “This is a wonderful opportunity to bring more products and services to people living with low vision and blindness throughout all of Northern California,” said Cory Hanosh, owner, North State Assistive Technology. For more than 60 years, Society for the Blind has created innovative ways to empower individuals living with low vision or blindness to discover, develop and achieve their full potential. Society for the Blind has grown from a dedicated group of volunteers that included the Lions Clubs of America to a nationally recognized agency and the only comprehensive rehabilitative teaching center that provides services for a 27-county region of northern California. The nonprofit provides low-vision eye care, life and job skills training, mentorship, and access to tools to maintain independence for 6,000 youth, adults and seniors experiencing vision loss each year. For more information or to make a donation, visit SocietyForTheBlind.org. North State Assistive Technology is an industry leader and statewide resource for products, technology assessments and training on devices for people living with vision loss. For more information, visit NorthStateAT.com.